This kit provides a very rapid and simple method to convert highly viscous saliva to non-viscous solution instantly, and then isolate the exosome from it. Diagnoses using exosomes derived from saliva have been attracting great attention in recent years because of the ease of sample collection. However, saliva samples are challenging when it comes down to exosome isolation. In addition to cells and cell debris, large amount of amylase, mucin and glycoprotein is present in saliva, making the sample viscous and hard to manipulate. Pretreated such as sonication and dilution, are often required. In many cases, the saliva samples can still be difficult to handle even after pre-treatment. This kit is specifically designed to address these issues using the proprietary saliva filters. Highly viscous saliva can be converted to non-viscous solution instantly by passing the sample through the filter. Exosomes can then be readily isolated from as little as 100 µl saliva using highly effective polysaccharide method. This protocol is developed and validated by 101Bio’s OEM partner. Spin column based protein extraction and cell fractionation technologies were developed by 101Bio’s OEM partner. Fig. 2 SDS-PAGE (10%) gel of isolated exosomes from 300 ul saliva. Fig. 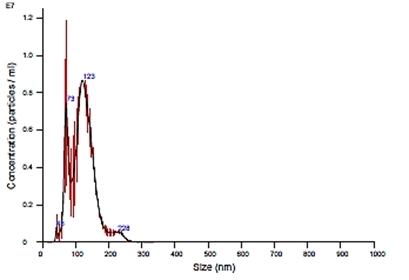 3 A) Exosomes isolated from 100 ul and 300 ul saliva by our P530 kit. B) Comparison of exosomes isolated from 300 ul saliva by different kits.